I love going to Mexican restaurants. All the ones around here have fresh chips and salsa on the table as soon as you sit down. I’ve occasionally had some sub-par salsa, but the hot, fresh chips are always totally addictive. 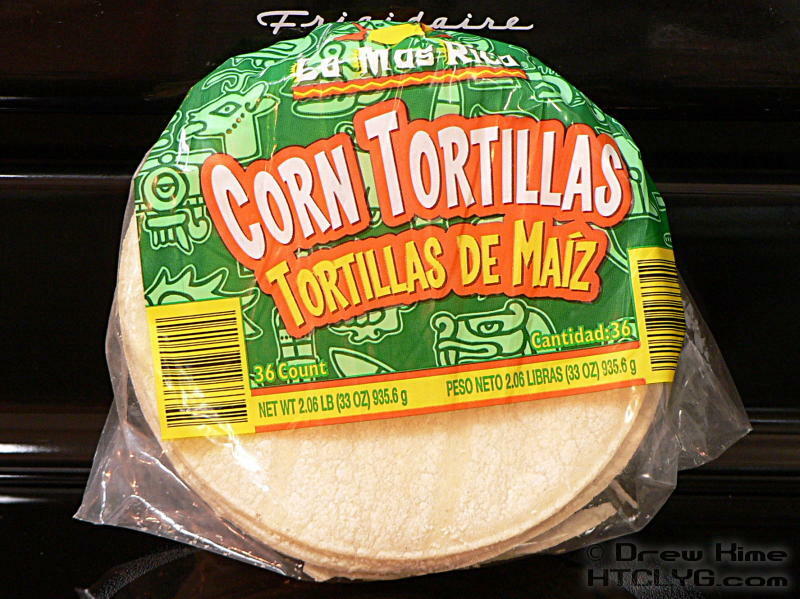 I’m not quite ready to make my own tortillas, but with a pack of 50 pre-made corn tortillas costing about a dollar — and the ingredients looking about like what I’d use myself — I’m okay with buying them for now. And the chips … oh, man, the chips are good. I’ll just do the recipe real quick, then have the notes about ingredients at the end. 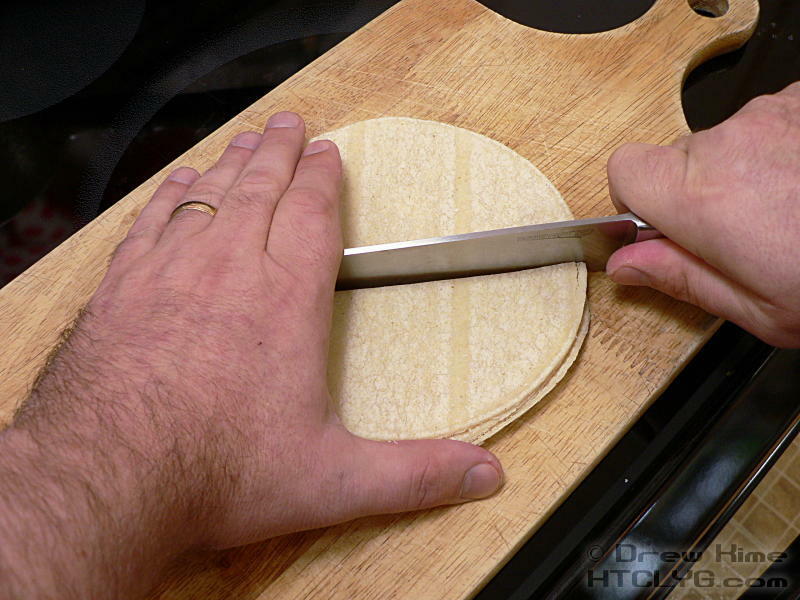 Cut the tortillas into six even pieces. I stacked up five of them and did them all together. Pre-heat your fat / oil almost to its smoke point. (Notes below.) I used a very small pot, so I wouldn’t need as much oil. And the tortillas float, so you don’t need it to be very deep. 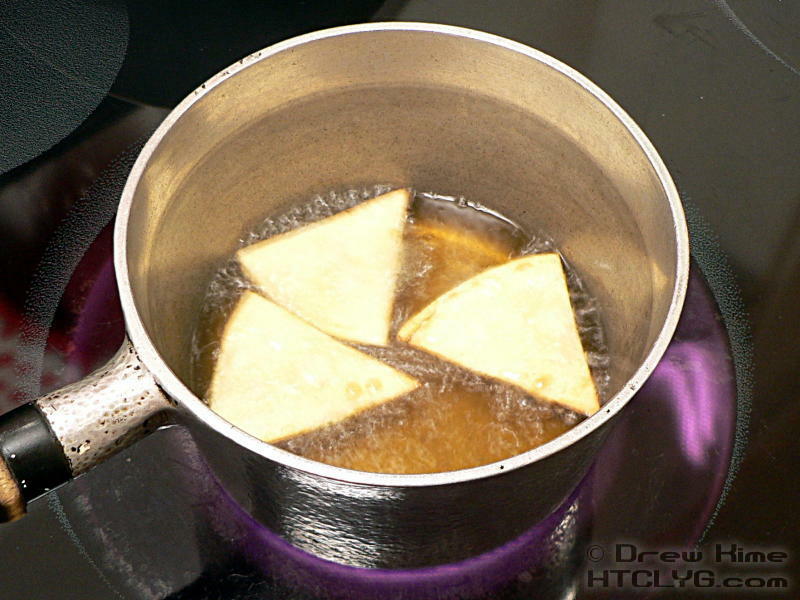 Carefully place three or four chips in the oil. You don’t want them to overlap, but they don’t need a bunch of space between them. When you see the edges starting to get dark, or the chip starts puffing up with bubbles, turn them over. Cook on the other side until lightly browned. Mine only took about 20-30 seconds per side. 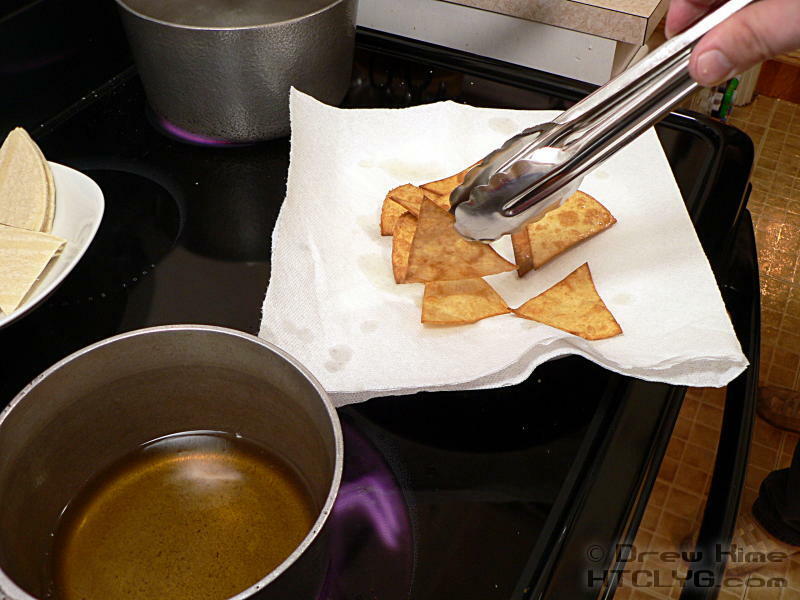 Remove to a plate lined with paper towels, letting excess oil drip back into the pot first. 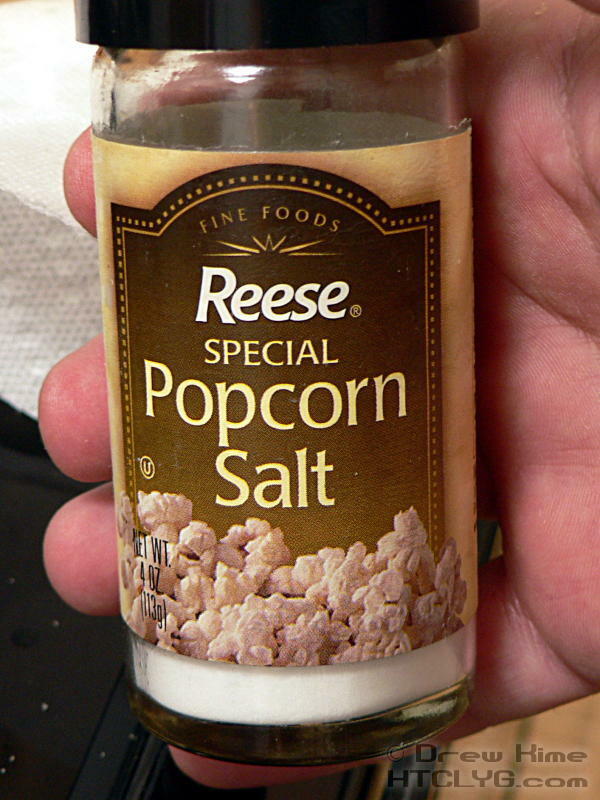 Sprinkle with popcorn salt, and that’s it. First, the popcorn salt. If you’ve never seen it, it’s plain old table salt, but ground finer, almost like powdered sugar. The smaller grains stick to food better, so the salt doesn’t all end up in the bottom of the bowl. Useful for any salty snacks, except pretzels. Once upon a time Mexican cooking relied on lard — pork fat — both as an ingredient and for frying. (It was also used around the world in pastries, like pie crusts. But I’m talking about frying here.) And American fast food places relied on tallow — beef fat — for frying french fries and … well, everything else that was deep fried. But some research seemed to show that eating saturated fat — mostly what you get in animal fats — is bad for you. This research wasn’t actually very good, but it was promoted heavily by companies that grew corn and soybeans. And wouldn’t you know, vegetable oils don’t have saturated fat. More and more people are starting to question this “conventional wisdom” that animal fat is bad for you — wisdom that’s only been conventional for about 100 out of 40,000 years of modern human existence. If you think back to when you first heard the term “trans fat” you’ll understand how recently it broke into mainstream consciousness that maybe eating a lot of shortening (AKA partially hydrogenated vegetable oil) isn’t such a great idea after all. But wait, there’s more. Not only was there a health-based movement against animal fats, there was also a strong economic driver in favor of more corn oil. In the 1960s, rising food prices became a national political issue. President Nixon told Secretary of Agriculture Earl Butz to do whatever it took to bring down prices. Butz told farmers to “get big or get out,” and to plant commodity crops like corn “from fencerow to fencerow.” This wasn’t merely a suggestion. He also reversed farm policy to make it happen. After the dust bowl in the beginning of the 20th Century, policies had been put in place to suppress overproduction. Butz reversed this policy, instead seeking to maximize productivity at all costs. Rather than keep a floor under prices for farm goods, the USDA would now lavish farmers with direct payments. That meant that if the market price for a good fell under farmers’ production costs, a government check to the farmer would make up the difference. This policy switch marks the birth of the subsidy system that remains controversial today. That means every bushel of corn and soybeans sold in the U.S. is federally subsidized. The more of it farmers grow, the more they make. Laws of supply and demand have been suspended. Every year in the United States 25 million pounds of valuable antibiotics — roughly 70 percent of total US antibiotic production — are fed to chickens, pigs, and cows for nontherapeutic purposes like growth promotion, according to a new report from the Union of Concerned Scientists. That led to CAFOs — Concentrated Animal Feeding Operations. It’s interesting to note that the government entity that defines “CAFO” is the EPA. (Check that last link again.) And that when you search Google for government sites that answer the question what is a CAFO the first two links are CDC and EPA (Center for Disease Control and Environmental Protection Agency). But this wasn’t supposed to be about beef, I was talking about frying chips. The point is, most restaurants and processed food manufacturers have switched to vegetable oils. They’re responding to consumer demand (based on bad science pushed by vegetable oil manufacturers), and to lower prices (based on federal subsidies). When you are cooking for yourself, you can ignore the bogus health claims; and you’ll end up spending less than buying the prepared foods anyway, so you might as well spend a little more for a better oil. For ethnic authenticity, you should fry tortilla chips in lard. If you’re going to be doing a lot of them, and you want the fat to last longer, go with tallow. But if you don’t have one of those, or if you really don’t want to use animal fats, you can get olive pomace oil. It has the same health profile as extra virgin olive oil, but without the flavor and with a higher smoke point. If you go searching online for information about pomace, you’ll find plenty of people saying it is a highly processed food and shouldn’t be eaten. You’ll also notice that many of those people work for — or are accredited by — trade groups promoting extra virgin olive oil. That doesn’t mean they are necessarily being dishonest, but take what they say with a grain of salt. Also, keep in mind if you buy processed foods advertised as being made with olive oil, it’s most likely pomace that they used. So you probably already eat it. One more good option is peanut oil. For people who understand why vegetable oils are not suitable for deep frying, this is the preferred choice for deep fried turkey. (Which, by the way, I’m trying to get some neighbors together for this fall.) It’s got a high smoke point and a light flavor. All that for some chips? No, of course not. After all, I had to put something on the chips, didn’t I? I’ll be getting to that by Friday, but first I’ll be showing you the cool new gadget I got after seeing it demoed in New York. 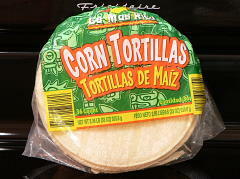 Stack tortillas 5 high. 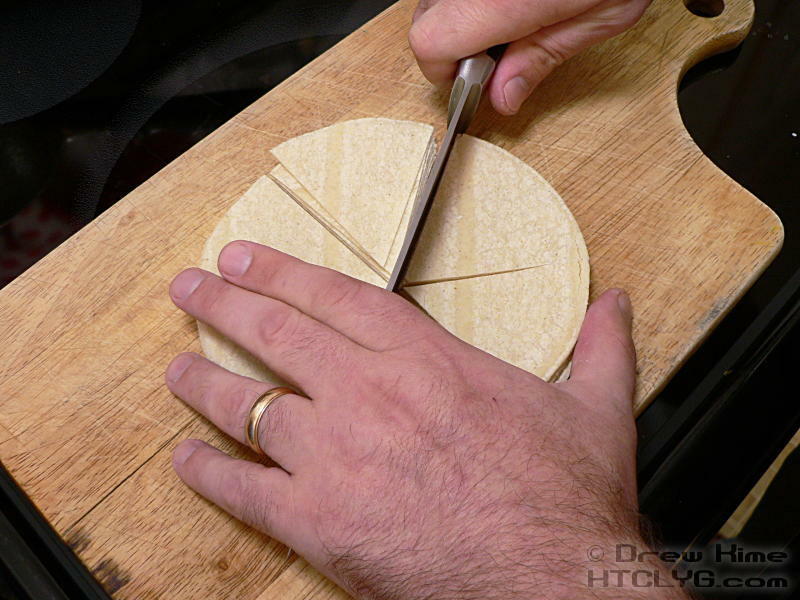 Cut the tortillas into six even pieces. Pre-heat your fat / oil almost to its smoke point. 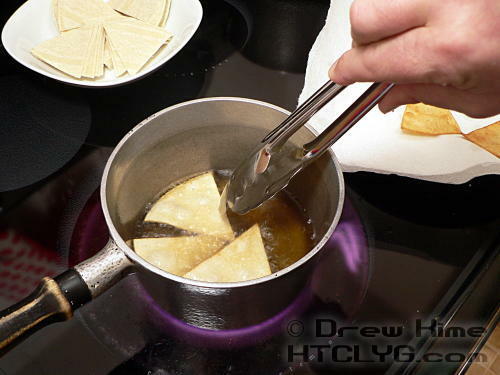 Carefully place three or four chips in the oil. As you get the hang of it, you can do more at once but don't stack or overlap. Turn when chips start to get dark, or start puffing up. Cook on the other side until lightly browned, about 20-30 seconds per side. Remove to a plate lined with paper towels.